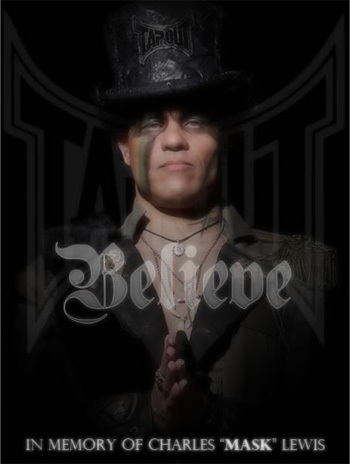 Exactly three years ago today, Charles “Mask” Lewis Jr. (Pictured), one of the founders of the popular mixed martial arts clothing brand Tapout, died when his car collided with a drunk driver in Newport Beach, California. To ensure the icon is never forgotten, TapouT Films director Bobby Razak is working to complete a documentary honoring his late friend. The movie, which is tentatively titled “Mask,” covers the life and passion of Lewis and looks to expand upon the values and ideals for which he was known. “I get to share the story…the real story, of what happened to my friend, who “Mask” really was and what he believed in,” Razak stated, who hopes to release the film in early 2013. “No one else can do this movie except for me. “Mask” will take fans on a journey through the life of Charles Lewis, who he was and what he was able to accomplish in his 45 years on earth.